Introduction: Metallothioneins (MTs) are a group of low-molecular weight, cysteine-rich proteins. In general, MT is known to modulate three fundamental processes: (1) the release of gaseous mediators such as hydroxyl radical or nitric oxide, (2) apoptosis and (3) the binding and exchange of heavy metals such as zinc, cadmium or copper. Previous studies have shown a positive correlation between the expression of MT with invasion, metastasis and poor prognosis in various cancers. Most of the previous studies primarily used immunohistochemistry to analyze localization of MT in renal cell carcinoma (RCC). No information is available on the gene expression of MT2A isoform in different types and grades of RCC. Materials and Methods: In the present study, total RNA was isolated from 38 histopathologically confirmed cases of RCC of different types and grades. Corresponding adjacent normal renal parenchyma was taken as control. Real-time polymerase chain reaction (RT PCR) analysis was done for the MT2A gene expression using b-actin as an internal control. All statistical calculations were performed using SPSS software. Results: The MT2A gene expression was found to be significantly increased (P < 0.01) in clear cell RCC in comparison with the adjacent normal renal parenchyma. The expression of MT2A was two to three-fold higher in sarcomatoid RCC, whereas there was no change in papillary and collecting duct RCC. MT2A gene expression was significantly higher in lower grade (grades I and II, P < 0.05), while no change was observed in high-grade tumor (grade III and IV) in comparison to adjacent normal renal tissue. Conclusion: The first report of the expression of MT2A in different types and grades of RCC and also these data further support the role of MT2A in tumorigenesis. Renal cell carcinoma (RCC) is the most common renal tumor, accounting for approximately 3% of adult malignancies and constituting 90% of all renal malignancies. Previous studies have shown an increase in immunoreactivity in lower stage tumor, suggesting a role of MT in enhancing the proliferative response of tumor cells during their growth cycle. ,, A number of studies have also demonstrated altered MT2A protein expression in RCC by the immunostaining approach. While most of these studies primarily used immunohistochemistry to analyze the localization and protein level of MT2A in tumor cells, no information is available on the gene expression of MT2A isoform in different grades and subtypes of RCC. In this study, we investigated the gene expression of MT2A isoforms in various subtypes and grades of RCC. Total RNA was isolated from tumorous and normal adjacent kidney tissue using the PureLink TM RNA mini Kit (Invitrogen, Carlsbad, CA, USA) according to the manufacturer's protocol. The concentration and purity of each sample were evaluated using a spectrophotometer at A260/A280. A total of 10 μg total RNA was treated with 1 U DNase I (Fermentas) for 30 min at 37°C and then heat-inactivated at 65°C for 10 min before reverse transcription to eliminate genomic DNA (gDNA) contamination. For first-strand cDNA synthesis, 1 μg of treated RNA in a final volume of 20 μL was used to synthesize cDNA using a super script III first strand synthesis system (Invitrogen). The mixture was incubated at 42°C for 1 h. RNA without DNase I treatment was used as a control to test gDNA contamination. After first strand synthesis, the reactions were heat-inactivated at 70°C for 5 min. Relative expression: 2 -(sampleΔCt-ControlΔCt) ; where ΔCt = average Ct (MT2A) - averageΔCt(β-actin). Specificity of the PCR products was confirmed by analyzing the dissociation curve. Data were expressed as mean ± SD. Statistical analyses was performed based on an independent samples t-test to compare data. P value less than 0.05 is considered statistically significant. A total of 38 cases of histopathologically proven RCC and corresponding controls were included in this study. Various characteristics of the patients included in this study are shown in [Figure 1]. The patients were in the age group of 35-76 years, with a mean age of 52.3 ± 13.8 years. Most of the patients were in their 5 th to 6 th decades of life [Figure 1]a]. Of a total of 38 cases of RCC, 30 cases were of clear cell carcinoma, four cases were of papillary cell carcinoma, three cases were of sarcomatoid carcinoma and one case was of collecting duct carcinoma [Figure 1]b]. The 30 cases of clear cell carcinoma included four cases of grade I, ninteen cases of grade II, five cases of grade III and two cases of grade IV [Figure 1]c]. [Figure 2] shows the quality of isolated RNA from different tissues. Quantitation of the expression profile of MT2A gene included the use of β-actin as a housekeeping gene for comparison. 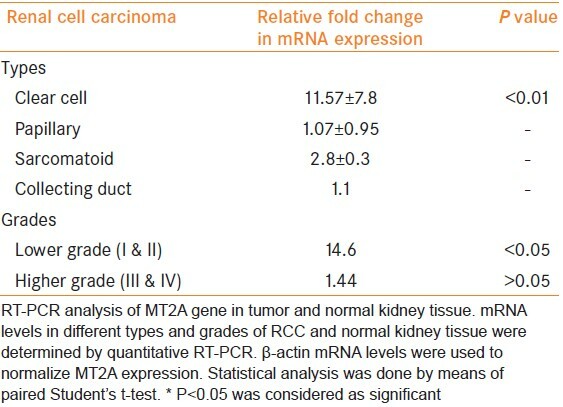 When compared with the corresponding normal renal parenchyma, quantitative relative expressions for MT2A were found to be significantly increased in clear cell carcinoma as compared with corresponding normal renal tissue [P < 0.01; [Table 1], whereas the MT2A expression was two- to three-fold higher in sarcomatoid carcinoma compared with normal renal tissue [Table 1]. On the other hand, there was no change in the expression of MT2A in papillary and collecting duct carcinoma as compared with their corresponding normal tissues [Table 1]. Further, when the MT2A expression was determined in different grades of clear cell carcinoma, MT2A expression was found to be significantly increased in lower grade (P < 0.05 in grade I and grade II; [Table 1]), whereas no significant change was observed in the higher grades (grade II and grade IV) clear cell carcinoma [Table 1] when compared with adjacent normal renal tissue. 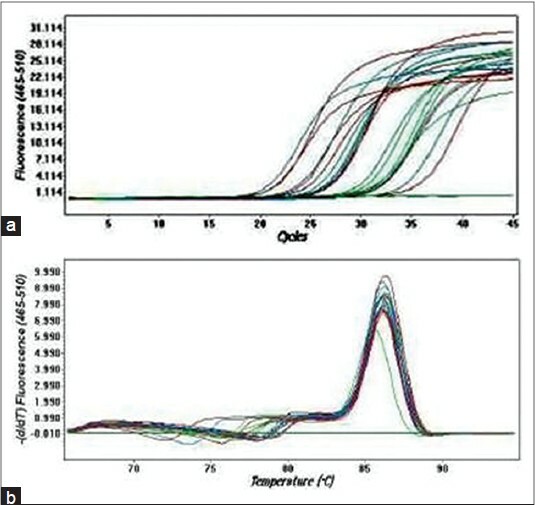 [Figure 3]a shows the amplification curves and [Figure 3]b shows the melting peaks of different samples. A single melting peak shows the specific amplified product in each sample. The primary goal of this study was to determine the expression profile of MT2A gene in different types and grades of RCC by RT PCR. In the present study, increased MT2A gene expression in lower grades (grade I and II) RCC indicates a possible role of MT2A in tumor growth and dedifferentiation. Our results are consistent with the previous studies. ,, There is no obvious explanation for the observation that lower grade tumors had increased MT2A gene expression relative to the other tumors in this study. However, one possible explanation is that the synthesis of MT may depend on the cell cycle, and it has been demonstrated that MT is preferentially expressed in S phase cells. , Notwithstanding, we observed difference in MT2A gene expression in various types of RCC but because of the small sample size in different subgroups of RCC, we could not draw any considerable conclusion related MT2A expression in various forms of RCC. In conclusion, this is the first study on MT2A gene expression in different types and grades of RCC. However, further studies are required to understand the role of MT in renal cell carcinoma carcinogenesis. 1. Cherian MG, Jayasurya A, Bay BH. Metallothioneins in human tumors and potential roles in carcinogenesis. Mutat Res 2003;533:201-9. 2. Cherian MG, Howell SB, Imura N, Klaassen CD, Koropatnick J, Lazo JS, et al. Role of metallothionein in carcinogenesis. Toxicol Appl Pharm 1994;126:1-5. 3. Mitropoulos D, Kyroudi-Voulgari A, Theocharis S, Serafetinides E, Moraitis E, Zervas A, et al. Prognostic significance of metallothionein expression in renal cell carcinoma. World J Surg Oncol 2005;3:5. 4. Izawa JI, Moussa M, Cherian MG, Doig G, Chin JL. Metallothionein expression in renal cancer. Urology 1998;52:767-72. 5. Cherian, MG, Huang PC, Klaassen CD, Liu YP, Longfellow DG, Waalkes MP. National cancer institute workshop on the possible roles of Metallothionein in carcinogenesis. Cancer Res 1993;53:922-5. 6. Kagi JH, Schaffer A. Biochemistry of metallothionein. Biochemistry 1988;27:8509-15. 7. Hamer DH. Metallothionein. Annu Rev Biochem 1986;55:913-51. 8. Nartey N, Cherian MG, Banerjee D. Immunohistochemical localization of metallothionein in human thyroid tumours. Am J Pathol 1987;129:177-82. 9. Kontozoglou TE, Banerjee D, Cherian MG. Immunohistochemical localization of metallothionein in human testicular embryonal carcinoma cells. Virchows Arch A Pathol Anat 1989;415:545-9. 10. Bahnson RR, Banner BF, Ernstoff MS, Lazo JS, Cherian MG, Banerjee D, et al. Immunohistochemical localization of metallothionein in transitional cell carcinoma of the bladder. J Urol 1991;146:1518-20. 11. Chauvin PJ, Cherian MG, Wysocki GP, Pringle G. A comparison of metallothionein expression in human normal and neoplastic salivary gland tissue using immunohistochemistry (abstract). Toxicologist 1992;12:379. 12. Mousssa M, Kloth D, Peers G, Cherian MG, Frei JV, Chin JL. Metallothionein expression in prostate carcinoma: Correlation with Gleason grade, pathological stage, DNA content and serum level of prostate specific antigen. Clin Invest Med 1997;20:371-80. 13. Ryvolova M, Hynek D, Skutkova H, Provaznik I, Kizek R. Structural changes in metallothionein isoforms revealed by capillary electrophoresis and Brdicka reaction. Electrophoresis 2012;33:270-9. 14. Eckschlager T, Adam V, Hrabeta J, Figova K, Kizek R. Metallothioneins and cancer. Curr Protein Pept Sci 2009;10:360-75. 15. Pedersen MO, Larsen A, Stoltenberg M, Penkowa M. The role of metallothionein in oncogenesis and cancer prognosis. Prog Histochem Cytochem 2009;44:29-64. 16. Huang GW, Yang LY. Metallothionein expression in hepatocellular carcinoma. World J Gastroenterol 2002;8:650-3. 17. Janssen AM, Van Duijn W, Kubben FJ, Griffioen G, Lamers CB, van Krieken JH, et al. Prognostic significance of metallothionein in human gastrointestinal cancer. Clin Cancer Res 2002;8:1889-96. 18. Arriaga JM, Levy EM, Bravo AI, Bayo SM, Amat M, Aris M, et al. Metallothionein expression in colorectal cancer: Relevance of different isoforms for tumor progression and patient survival. Hum Pathol 2012;43:197-208. 19. Thirumoorthy N, Shyam Sunder A, Manisenthil Kumar KT, Senthil Kumar M, Ganesh G, Chatterjee M. A review of metallothionein isoforms and their role in pathophysiology. World J Surg Oncol 2011;9:54. 20. Sharma U, Singh SK, Pal D, Khajuria R, Mandal AK, Prasad R. Implication of BBM lipid composition and fluidity in mitigated alkaline phosphatase activity in renal cell carcinoma. Mol Cell Biochem 2012;369:287-93. 21. Tuzel E, Kirkali Z, Yorukoglu K, Mungan MU, Sade M. Metallothionein expression in renal cell carcinoma: Subcellular localization and prognostic significance. J Urol 2001;165:1710-3. 22. Fuhrman HA, Lasky LC, Limas C. Prognostic significance of morphologic parameters in renal cell carcinoma. Am J Surg Pathol 1982;6:655-63. 23. Nguyen A, Jing Z, Mahoney PS, Davis R, Sikka SC, Agrawal KC, et al. In vivo gene expression profile analysis of Metallothionein in renal cell carcinoma. Cancer Lett 2000;160:133-40. 24. Krizkova S, Fabrik I, Adam V, Hrabeta J, Eckschlager T, Kizek R. Metallothionein-a promising tool for cancer diagnostics. Bratisl Lek Listy 2009;110:93-7. 25. Kondo Y, Rusnak JM, Hoyt DG, Settineri CE, Pitt BR, Lazo JS. Enhanced apoptosis in metallothionein null cells. Mol Pharmacol 1997;52:195-01.